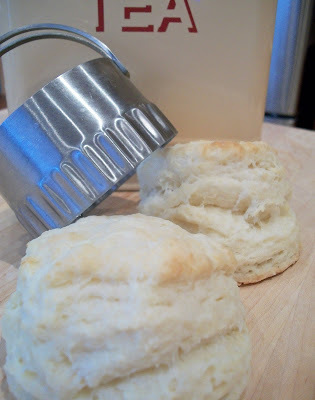 Light and fluffy traditional buttermilk tea biscuits! I woke up today craving one topped with butter and jam. So I got baking bright and early. These are a wonderful way to start off the morning. The biscuits have incredible rise and are layered with flaky, buttery goodness. Plus the recipe is so simple there really is no excuse not to make them part of your weekly baking regimen. cold butter (1/2 a cup or 1 stick of butter) *grated. ADD grated butter, combining with a fork. Dough should resemble coarse crumbs. ADD buttermilk and stir until dough comes together in a shaggy mess - hey, no other way to describe it! WITH floured biscuit cutter or drinking glass, cut out circles. 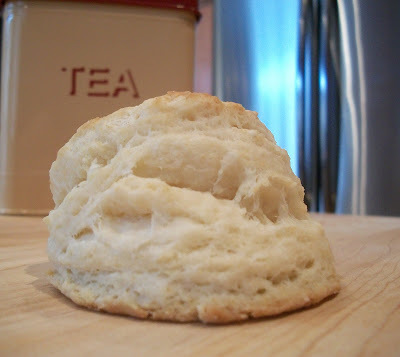 This recipe made 7 large biscuits for me. BAKE for 15-18 minutes. Mine were perfect at 16 minutes on the dot ! Top with butter, jam, lemon curd, clotted cream... the list goes on and on. You can add up to 3 tablespoons of sugar - it all depends on how sweet you like your biscuits. hmm very strange. be very careful that you do not overwork the dough. And ensure you added the correct amt of baking powder. Lastly preheat your oven and let it be at the full cooking temperature for at least 10 minutes before putting the biscuits in the oven. Good luck !